The main new feature introduced in ver.1.6 is project parameters. Since it's a major feature here is a separate article about parameters in EasyMorph. Label Columns takes one or more top lines of a column and creates a column name from them. It's intended for processing spreadsheets where column names are often split across several rows. With the introduction of Import from ODBC in previous release we tested a new data import algorithm with pre-compression for sequential data sources. It works well and in this release we switched Import Text to this algorithm. Now text files are loaded 20-30% faster with 50% less memory footprint. 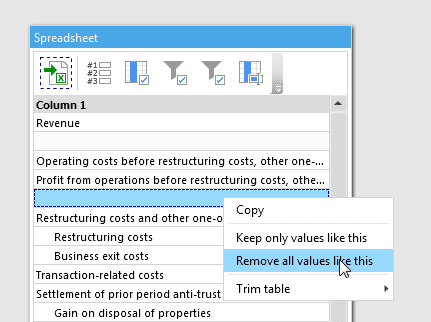 Now you can filter/remove values from table just by right-clicking it and choosing Keep only values like this or Remove all values like this from the menu. For instance if you need to remove all rows with empty cells in column Customer Name simply right-click any empty cell in this column and choose Remove... . The same way you can trim tables removing unwanted rows below or above the clicked cell.